CSters is a club at Rice University created as a network for individuals interested in Computer Science. We specifically support female enrollment in Computer Science at Rice; however, we extend an open invitation to all individuals interested in the potential of computing. CSters was founded in the Spring of 2002 by a group of female Computer Science undergraduates who realized the importance of supporting women in this field. Our activities include a mentorship program that pairs upperclassmen and graduate students with lowerclassmen, informative lunch talks featuring faculty, students, or industry professionals, and various outings. We also sponsor members to attend the annual Grace Hopper conference. For a more detailed description of who we are and what we were founded to do, please see our constitution. For more information on sponsorships and events, please email us at csters.rice@gmail.com. Our current faculty sponsor is Lydia Kavraki. 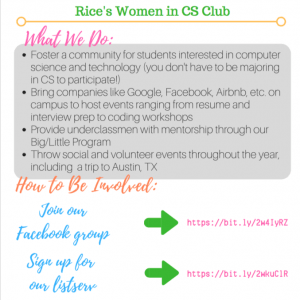 CSters is a club at Rice University for women interested in computer science and related fields.